Normally, for the better part of my career, I have been an optimist about a particular season before the first game has been played. I’m sorry but I can’t feel that way right now about the Buffalo Bills. While I don’t usually put much stock into the preseason, this year I feel the preseason for the Bills is indicative of how they will play. Why do I feel that way? The offense has too many question marks and the talent on the offensive side of the ball isn’t what a winning team in the National Football League has. At this time last year, the Bills had the same question marks and we saw that the defense was able to carry a subpar offense to a winning record and a spot in the Playoffs for the first time in almost 20 years. This year, while the defense can probably be just as good and maybe ever better, the offense is actually weaker. I actually feel that at quarterback, Nathan Peterman will be a huge upgrade over Tyrod Taylor. But the offensive line is weaker, as is the wide receiver corps. Those two groups have to really come on in order for the Bills to be successful. The schedule doesn’t help. Last year on paper, the Bills schedule for the first four games looked just as difficult as this year and they were able to start off 3-1. The Bills are going to have to do the same thing this year in order to even get to .500 on the year. Sunday the Bills travel to Baltimore and even though I think that Baltimore may not be a playoff team, it is still a tough game to start with especially on the road. The strength of the Ravens is their defense and the Bills offensive line better be ready for a brawl as the Ravens front seven is outstanding. The Bills lost two Pro Bowl type players along the O-Line and that is tough for any team to replace. Eric Wood was one of the better centers in football and was the leader of the group. Richie Incognito may be a nut case but he could play and right now the Bills replacements for those two aren’t in the same league as Wood and Incognito. Ryan Groy is a tough over-achiever who a team can get by with, but he has to have strong players beside him at the guard slots. The Bills don’t have that with John Miller and Vlad Ducasse. Both can be revolving doors when it comes to pass protection. 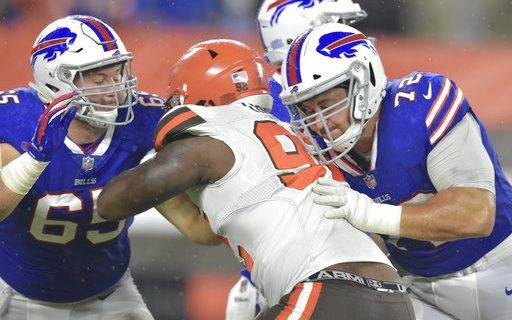 With the problems at pass protection, the Bills have to have a strong run game and from what I saw in the preseason I’m not sure that will be the case. The Bills will struggle in pass protection and with their wide receiver corps being the way it is I don’t see the pass game being that good. Kelvin Benjamin can be a good possession type receiver and Zay Jones has talent but he has to become a more disciplined player. The weakness in the Bills receiver group is right now, they don’t have anyone who scares a defense and that includes the tight ends. What that all means is that much like last year the Bills defense have to keep opponents under 14 points and create turnovers. If that happens, then the Bills have a shot at being in every game. The personnel of the defensive side of the ball is strong. The defensive line is at least seven man deep and when a club has that many defensive linemen who can play, they are able to keep players fresh. The linebacker corps is young and fast but also has a big question mark. Last year the leader of the linebacker group is the departed Preston Brown, who led the Bills with 144 total tackles. As productive as Brown was, he wasn’t a real fit for the scheme and he has been replaced by first round pick Tremaine Edmunds. Edmunds has the skill set to be a very good NFL player but he is still a rookie who is being asked to run a defense and he will go through some growing pains. Lorenzo Alexander and second year man Matt Milano will be very good in this scheme. The secondary also has a question mark at corner. E.J Gaines is gone but he had a productive season. As I write this the starter at his position still has not been named. It will be either Vontae Davis or Phillip Gaines. He rest of the secondary is very strong and are capable of playing even better than they did a year ago. How will the Bills do? Until I see something different than what I saw in the preseason I can’t see the team being any better than 8-8. I hope I’m wrong but they have to play much better than they have the last month for me to be wrong. Let the games begin.